Contact Us to Book! Fill out the contact form and get in touch. The day starts with a pickup from the airport or your hotel in Sandakan before transferring by land to Sepilok Orang Utan Rehabilitation Centre for the orang utan experience. 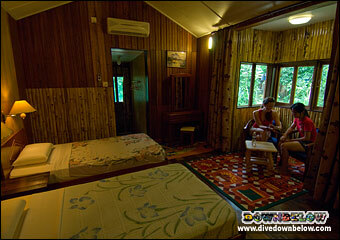 After lunch at the Sepilok Jungle Resort, you will transfer to your accommodation on the banks of the Kinabatangan River. Upon arrival the the lodge, you will check-in and enjoy afternoon tea and refreshments. Your first boat-cruise takes place at 4pm, during which you will search for wildlife and bird along the river. Return to the lodge and freshen up for dinner. After dinner, if the weather allows, you will enjoy a 1-hour night walk in the Bilit Forest to see nocturnal wildlife. (Excluded from 2D/1N Program) The gibbons and birds will be your alarm this morning, so why not start the day with an early river cruise at 6am? You return to the lodge after your boat-cruise to enjoy a scrumptious breakfast. Late morning you depart by foot for a guided jungle walk to Ox-bow Lakes to see if you can spot more wildlife. When darkness falls, and weather permits, you will once again explore the jungle to see what nocturnal life you can spot in the jungle. Return to the lodge for dinner and spend your second night at the lodge. Breakfast is served first thing in the morning and, around 8am, you will depart the jungle lodge for your transfer and visit to the Gomantong Caves. After exploring the cave, one of the largest producers of bird nest soup in the region, you will return to Sandakan. You will enjoy lunch at a local restaurant en-route and then transfer to the airport or your hotel in Sandakan – depending on your arrangements.